The Undead Legion is made up of Lore's finest undead (and not-undead-yet) warriors. 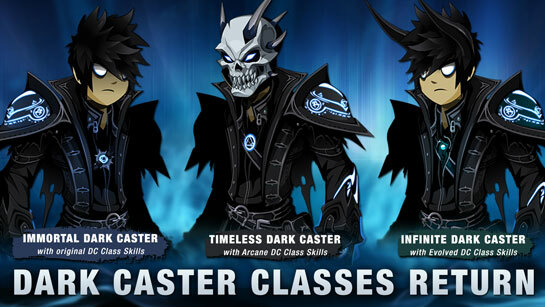 That is why we're bringing back ALL the Dark Caster Class skills, tied to new art created by Dage just for this event. Each of the Class armors you see above is built on art created for the last-ever, final, totally-not-going to ever be another Eternal Dark Caster. * There are variants to each to help distinguish between the classes in shop. * Every year, Dage vows it will be his last Dark Caster. But every year, we get new, incredibly passionate requests to keep the line going. We hate disappointing you guys, so each year, he goes back to the design. It would be easier to do new designs and create new traditions, but with as much as you guys love this particular line... we keep updating it. Dark Caster Classes get buffed! With the return of the Arcane and Evolved Dark Caster class skills, it is time for… BUFFS! This allows all Dark Casters to make full use of their high Intellect state. This class uses the Evolved Dark Caster class skills. You can see the original Class Skills writeup here. If you have the original Evolved DC or the Legion Evolved DC Class, you will get the Infinite Dark Caster Class for FREE. Talk to Dage in the /darkbirthday map to complete his quest to claim your free class. These changes also apply to Evolved / Legion Dark Caster. This class uses the Arcane Dark Caster class skills. You can see the original Class Skills writeup here. If you have the original Arcane DC or the Mystical DC Class (which unlocked when you purchased one of the event rare armors), you will get the Timeless Dark Caster Class for FREE. Talk to Dage in the /darkbirthday map to complete his quest to claim your free class. Skills for the Timeless Dark Caster (and Evo/Legion DC) were buffed earlier in February, in preparation for Dage’s birthday. You can see a list of those changes here. This class uses the original Dark Caster class skills... but is getting a nice buff! You can see the original Class Skills writeup here. If you have the original Dark Caster Class, you will get the Immortal Dark Caster Class for FREE. Talk to Dage in the /darkbirthday map to complete his quest to claim your free class. We will also be adding the class's armor next week, just for you! Plus, complete your "Obtain the Dark Caster Class" quest to get the original class art's armor. Next Friday: we’ll be re-releasing and buffing the original Dark Caster class skills. These will be available directly on the original class, and will also be available on the new Immortal Dark Caster class. Earlier this year, when we were planning out the return of the Dark Caster classes, our plan was to bring back a buffed version of the original DC class. That plan grew and morphed into a Tier 2 version of the original Dark Caster Class, which Dage was a HUGE fan of. And like Light Caster, this class will be permanently available, year-round, for anyone with any of the Dark Caster classes. Everyone will need to farm for the class (no shortcuts). Dage the Evil really wanted something dark, stellar, and standout as a Tier 2 for you guys, and so do I. (So do Pisces and the class team, too) For a class like this, we want to take the time and do it right for you guys.